Sergeant Eldon Petty Jr. is a cop at nonstop war with both internal and external forces, not the least of which is his own distorted sense of ideology. Produced in an atmosphere tattered by the hysterics of rebellion and the blood of the innocent, he's at the core of the biting commentary so vividly utilized in Ron Shelton's cop drama "Dark Blue," emerging as a man without personal motive or free will because the system he is trapped in refuses to accept its slaves as thinkers or individuals. We don't automatically assume he was easily snared into this behavior, and yet it's difficult to imagine any other possible scenario or outcome. After all, what kind of person would you be if you had surrendered your dedication over to a world where corruption and politics were the only two integral driving forces? The title of the film refers itself strictly to police uniform, but the film's subtext goes a step further by linking it to the foundation of human attitude and inhibition in a famous segment of society. As the movie opens, we're taken into the cold, dark and bruised heart of Los Angeles mere breaths away from the impending verdict of the Rodney King trial, to be inevitably followed by the riots that turned the city into an even bigger playground of violence and disorder. The merciless behaviors of ordinary street civilians mirrored and magnified within the system itself, cops and outlaws coexist like they're interchangeable forces of evil, doing only what is expected of them because generational patterns have obligated them to. As the main character so wisely puts it during a crucial crime investigation, "this was a city built with bullets," although we gather it wasn't an unwilling sacrifice for either party. 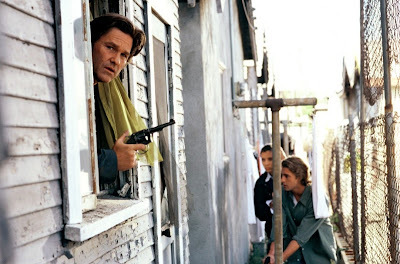 Kurt Russell plays the Perry character, a shallow, transparent, viscous and downright loathsome creature who so closely treads the lines of anti-Semitism that it almost induces mental collapse ("you care more about the people you hate," his frustrated wife insists during one scene). But was he always that kind of person? The assumption is, of course, no, although the movie cleverly doesn't specify; what it does instead is explore the layers of solecism within the Los Angeles Police Department that have molded several of its key employees into such revolting people. This world doesn't just twist men and women into thoughtless machines, it completely robs them of essential human functions. The question then is not why or how it happens, but when does it become inevitable for someone to stand up and defy the pattern. The early scenes are unflinching in their exposé of demoralized law enforcers. Perry and his partner, the young and handsome Bobby Keough (Scott Speedman), appear before the department's shooting board following a face-off that left one criminal dead. Board members accept their seemingly matched explanations, but the suspicious and inquisitive Deputy Chief Arthur Holland (Ving Rhames) knows better than to brush off the situation without making further investigations. Did Officer Keough really shoot the guy in question, or is he taking the rap for his older partner? Was it a shooting based on race? Holland goes to great lengths to have these questions answered truthfully, although it's hard to get an accurate response in a realm where racism is inclusive and being a trigger man can actually improve a cop's reputation. The film's makes occasional leaps to other minor stories, all equally potent, but its primary focus is on the two partners. Officer Keough is a relatively new face to the department, not yet devoured by its evils, but he sometimes lacks the nerve to speak up on occasions when he knows fellow officers, particularly Petty himself, are going about things wrong. When he does in fact have a voice, though, he is often ridiculed or lashed out at because of it. "You don't question—you follow," his partner so angrily protests when the young lad refuses to frame two innocent men of a killing because their superior asked them to. And yet he follows the orders anyway, maybe because of peer pressure, maybe because of obligation to the department, or maybe because the evil itself is now starting to take hold of his willpower. In any case, he caves in. The movie has an interesting sense of layering motives, ideals, arguments and perspectives both inside and outside the walls of justice. There is corruption smeared across the surface, corruption planted in the deep fabric, and even more levels of corruption clinging on to the edges. Characters all equally show an allegiance to this notion, sometimes even following discolored instinctive without even realizing their own moral fragmentation. Others are fully aware of their jagged edges, and some try to restrict their sense of disorder in order to restore free will. Some, furthermore, continuously follow the pattern because they have no mindset to do otherwise. Kurt Russell and Scott Speedman give electric performances here as the core partners, emerging from complex character writing not like they're back-seat passengers to the plot, but rather the actual drivers. Ditto to Brendan Gleeson, who undertakes the role of the LAPD's head honcho Jack van Meter with such calculated precision and authenticity, the audience never calls into question his image as a detestable and two-timing ignoramus. There is, alas, one scruple with this setup that keeps the movie from being truly satisfying, and that involves the film's climactic speech, which shows that men like these who have been completely distorted through the system's fallacies deserve sympathy, but doesn't actually find the right methods to redeem them. The speech, furthermore, is overlong, too self-indulgent, and a bit obvious as a tool for closure. The movie could have predictably resorted to a pointless violent resolution, but that doesn't make this current one any less grievous to endure. The script by David Ayer is one of the most well-written and incisive entries in the good cop/bad cop formula of the recent years, a narrative greatly more interested in the various angles of human psyche than bloody shoot-outs or large body counts. The violence exists, almost as necessarily as any film taking place in Los Angeles would, but it doesn't upstage the dramatics of the narrative in the least; in fact, it helps to illustrate them. The Rodney King backdrop is perhaps the most ideal climate for these events to play out in as well, and yet the writer never tries to overemphasize the connection, either. During the final moments of the movie, Perry looks out over a city in turmoil finally realizing how it has all come to be, and what must be done in order to seize and understand the issues before they're too deeply rooted to be remedied. He doesn't expect change to occur overnight simply by coming into a new direction, but the message, as in most things, remains the same—if you're going to change the world, you at first have to change yourself. Kurt Russell: Sgt. Eldon Perry Jr.